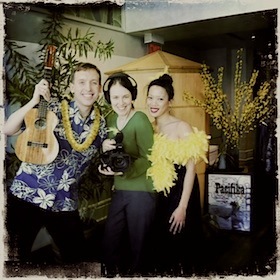 You are currently browsing the The Accidental Hawaiian Crooner blog archives for February, 2011. I can’t believe that we’re celebrating one whole year of being LIVE here at www.accidentalhawaiiancrooner.com! So many wonderful things have happened this year! But the best part of all is being able to connect with folks like YOU. We’re building a community of folks from around the world here on the website. And that was the dream. A giant MAHALO to each and every one of you! I was thinking about what I would post on our first anniversary. And I went back over some of the older blog entries. It seems fitting to repost our very first blog entry today. We’re embarking a new year–full of new adventures. And we’re excited to share ‘em all with you! When I was a kid, I was on a swim team. I loved being in the water and I loved my teammates. But Saturday mornings, we’d head to the pool for the swim meets and I hated them. I never enjoyed that feeling before a race. Standing on the starting block, muscles poised and ready to spring into action, the adrenaline would give me a headache, and my stomach felt like a volcano full of bubbling lava, threatening to erupt. Hearing those five little words made me want to jump off the block and run and hide in the bathroom. The Hawaiian equivalent of that phrase is also a call to action. 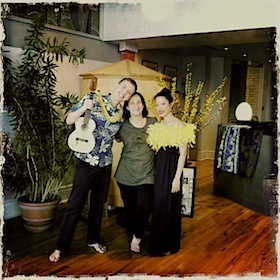 It’s something that every hula dancer knows — the final call from the chanter to bring everyone to one mind. The call to prepare for the dance and for the hula beat to begin. Over the last few weeks, I’ve been working with my wonderful team to get this website ready to launch. Sorting through pictures. Writing essays for the site. Working with friends on the East Coast, the West Coast and in the Islands. But this call to action doesn’t make me anxious. It’s a snap to attention so that I can focus on the tasks at hand. It drives me to discover new ways to share the things that I’ve been learning. It inspires me as I work with the team to create a website that folks will want to come visit. And it reminds me to look around and take in all of the magic that’s happening. To really savor the moment. Maybe this call to action doesn’t make me nervous because it’s not a race. It’s not a competition. It’s not about rushing to the finish line. This time, the call to action signals the start of a journey. And instead of holding my breath, I relax and exhale. ‘Ae. Let’s start this new chapter in the Crooner’s life. **Crooner Update: Wow! You must all be avid snorkelers! Because everyone had the correct answer! It was C. Hanauma Bay, of course! And this week’s winner (chosen randomly by my handy, dandy random generator) is… (Drum roll, please…) STEVE! Congrats, Steve! You’re this week’s Trivia Superstar! Hope you all had a great Aloha Friday. I have been working on a writing project for a while. Wait! Let me clarify that: Most of the time, I THINK about the writing project. I READ about other writers’ processes. I PLAN how it will come together as a final product. However, I haven’t done very much WRITING. Yup. I’ve got some serious issues. I set out on a quest to figure out how to knock down some of these walls that I’ve built to keep me from writing. One of the many books I’ve been reading is Judith Barrington’s WRITING THE MEMOIR: From Truth to Art. (It’s absolutely brilliant!) And it was in this book that found her “blocks exercise.” When I saw it, I was excited. And I was terrified. But today I took the plunge and jumped in. It was really hard. And it was also TOTALLY WORTH IT. As I wrote my way through the exercise, I saw some things that were definitely impeding my writing process. It was like looking in the mirror and not turning away when you don’t like what you see. I couldn’t deny the truth–just like I can’t deny those gray hairs or “smile lines” that have appeared over the years. And… I also saw that these very same “blocks” that were affecting my writing were holding me back in other parts of my life as well—including performing. And that shocked me because I thought I threw myself into performing 100%. I had to admit that in some ways, I’ve been holding myself back. Talk about a wake up call! Immediately after the exercise, I felt like I needed to take a nap. But that wasn’t really an option. So, I put the notebook away and started in on the other 5,000 things on my TO DO list. A few hours later, I went back and revisited what I’d written. And you know, it’s still tough to see things written out so clearly. In my own handwriting. But there it is. And now that I can see it, it will be hard to continue to allow those things to “block” me from doing what I want to do. My eyes have been opened. But I’m absolutely a work-in-progress. How do YOU work through the “blocks” in your life? This song, which also happens to be the title of the album, has been a favorite for a long time. The album was one of the first in my collection of Hawaiian music. 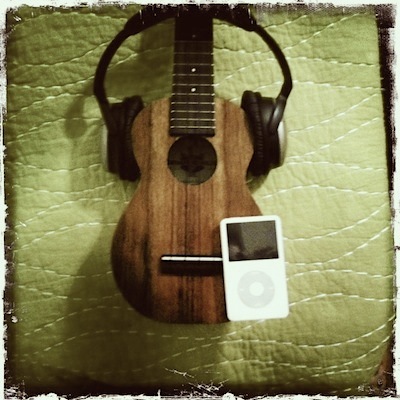 I listened to it constantly as I tried to wrap my mind and ears around the sounds of the Hawaiian language–which, as a newbie to all things Hawaiian, was totally foreign. I had never heard anything like it. This song is attributed to the singer, Alice Johnson. However, the version recorded by Led Kaapana is strictly instrumental. 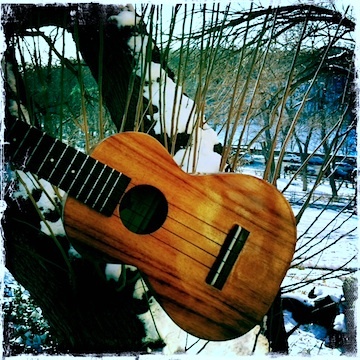 But don’t let that fool you–his slack key guitar really sings! 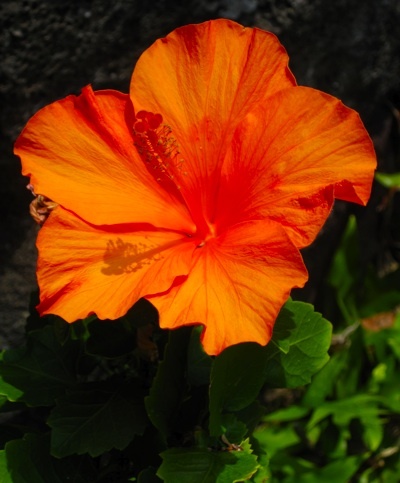 I’ve heard the version that was recorded by Maui’s beloved Hoʻopiʻi Brothers. And it’s truly magnificent! But this week, I’ve been obsessed with Uncle Led’s recording. Here’s the scoop: I made a random playlist a while ago and I’d included this song. I chose to play the compilation earlier this week and when this song came on, I stopped in my tracks. His guitar is played as though he is a living metronome with such a steady rhythm. As a musician, I have a terrible time trying to keep my rhythm consistent throughout a piece. I speed up and slow down. (I’m so embarrassed to admit it!) However Uncle Led is a master musician who clearly recognizes that slow and steady wins the race. I fantasized that I could hear the “thub dub” of a heartbeat in between the notes he played on the guitar. Listen to it–you’ll see what I mean! The liner notes for this album are great–in just a few words, they manage to tell the story of the song and Led’s involvement with it. Click HERE to read them. From the opening sounds of the steel guitar to the final melodic flourish, this recording by Aunty Linda Dela Cruz is a classic. The simple strum of the ukulele, the lovely harmonies provided by Benny Kalama, Alice Ferdinand and Sybil Andrews, and the vocal prowess of Linda Dela Cruz paint a stunning portrait of ʻAkaka Falls on the island of Hawaiʻi. There is no questioning why Dela Cruz was known as Hawaiʻi’s canary. Her soprano, which reaches thrilling heights, seems like a bird’s song. She embraces the vocal flourishes/embellishments of the time–it’s almost like a textbook of HOW to stylize a song from that period. I love her and her wonderful recordings. I study them faithfully because they are a shining example of the Hawaiian sound. Yesterday I got to witness the birth of a new song and hula! It was so cool. The piece was written by two friends of mine. It’s amazing to think that only months ago, it was just an idea. I was honored to be given the chance to study the music and lyrics–and then to help bring it life! A collective of brave souls got together to make magic happen. To see a piece go from an idea to a “realized vision” was incredible. It really was like witnessing a birth. And it was beautiful to see how all of the pieces are INTERdependent. The composer/choreographer, videographer, dancer and musician all needed to do their part. We represented different pieces of the same puzzle. We needed to be in sync with each other. We trusted that we all shared the same vision. And we jumped into the project together. It wasn’t fancy. It was homegrown. It came from the heart. Stay tuned. The editing/”polishing” process has begun. And hopefully I’ll be sharing this new song/video with you all SOON!